Sparring can be intimidating at first, however, you have a chance to implement what you have learned so far. It has seriously other incredible benefits as well. And whether you are a beginner or advanced in boxing, sparring is truly a must and surely improves you in so many different ways. And below you can find all of these benefits of sparring in boxing. Also if you do any martial arts training (BJJ, wrestling, MMA…), you will get these benefits as well. “real environment”. Truth is that you may never feel “ready”. Because you can get excited, be scared etc… and that is completely normal. In sparring, you dodge, move away and punch a real person. It is truly amazing to try all of these in the ring. After you finish sparring whether you were good at it or not, it will give you feel a sense of accomplishment. And it is truly priceless. You already have punched heavy bags countless times but this time training is totally different and you need to punch a real person with a proper punching technique. You realize how to land a punch, when to punch and how to defend yourself. Sparring sharpens your attack, defense skills and improves timing and reflexes at the same time. After you punch the heavy bag it will swing and if it has optimal resistance rate you will have a short period of time for practicing your footwork. You can also practice footwork elsewhere but it should be practiced while sparring because you react according to a real person’s reactions and as you guess this improves your footwork the most. You do sparring for improving and sharpening your skills but you also do it to see what you are good at and what you are bad at. You may have lack of speed, quickness then you realize that you should jump rope more or train more with agility ladders etc. Or you may not have a habit of keeping your hands up all the time then you need to train with a speed bag more often. These are common mistakes which many people do during sparring sessions. With that after sparring you can make a new boxing training routine according to your weak sides. Also when you do shadow boxing, you can even imagine what happened during sparring and you can train according to it. With practice, you will be readier for the next sparring session. Important Note: You should always do sparring with ALL necessary equipment for you and your sparring partner’s safety as well. Always wear boxing gloves which have soft padding and other necessary safety features such as “attached thumb”. If you want to know more about sparring glove’s features and recommendations, which provide incredible quality and “safe” training sessions, then definitely check out here. Other than that definitely have a good boxing headgear, mouth guard, hand wraps and boxing short as well. These are important for safety and your training quality. Sparring is a really intense workout. You punch, dodge, defense, do every movement which you have learned so far. And you do these under pressure. According to calorie lab, 170 Lbs. 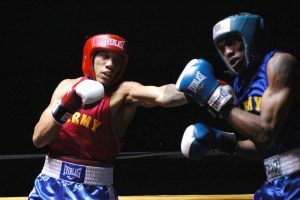 a male individual can burn 350 calories during 30 minutes of a sparring session. And let’s not forget that because of adrenaline rush your heart probably beats so much faster than normal during sparring. So you can even burn more calories! And this actually happens to me all the time when I spar and I am sure that many of you already felt the same. In sparring training back muscles work a lot. When you punch a heavy bag it holds you. Because of this, you don’t use back muscles a lot during punching bag training. With that sparring is totally different. You are punching with gloves which have more padding. So these are heavier than other glove types. Also, when you miss a punch you need to put in extra effort to hold yourself. In that way, your back muscles work more, you burn more calories and as a result, you can be sure that your back muscles will be more toned. When you spar you literally try landing punches on your opponent and other than learning how to attack and defense you also try beating your opponent. With that, your sparring partner also does the same. So your focus should be on the task all the time. With that, it is so easy to lose your focus during punching bag or speed bag session. When you go to a boxing gym, I guarantee that you will see someone who punches a heavy bag without any purpose. This slows down your skill improvement and it is actually a huge minus of punching bag training. However, you need to focus all the time while sparring. Because if you don’t, you can get a punch in your face. Even though you are strong, have muscles etc… you may not have skills to protect yourself. And I know that so many people, who claim to be strong, haven’t even hit someone or something in their entire lives. Sparring provides you self-defense skills and you can actually use these skills in your real life. There are lots of people, who come to boxing classes, for learning these skills and as a side note, first boxing gloves were made for teaching self-defense. I hope that you enjoyed the content and if I missed any benefits of sparring please let me know in comment section. 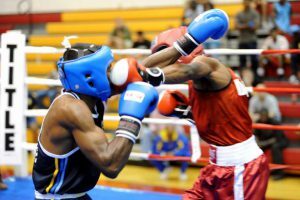 Next post: Speed Bag vs Double End Bag – Should you Choose one? I didn’t realize that sparring had so many benefits. I thought it was just to get practice but as you’ve listed I can see now there are so many other benefits to it. Going up against a real person would involve you learning different things about how you spar and what you need to work on. I’ll only done sparring a few times and I could tell right away it was completely different than what it feels like when you practice with a bag. It is totally different than training with heavy bag, because you sparring will hit you back 😉 It takes some practice but it will be definitely more than a workout. At first I really scared but now it is much better. I still could not get used get punched but it is definitely better than first months. Hey Furkan, I like your site but have always thought of boxing as a brutal sport. I know sparring is in preparation to fight but never could have imagined all the benefits you get from just sparring. Keep punching at this, it’s working. Man you can get many benefits from it, it is scary at first but it has incredible benefits I personally like having way denser muscles 🙂 Because we seriously push ourselves there.